Age-related muscle loss is a natural part of growing older. In fact, once you hit the age of 50, muscle mass decreases by up to 2 percent each year. And that inevitable loss of muscle may be affecting you more than you think. When Duke Health put 775 people between the ages of 30 and 100 through a series of simple exercises, the research team discovered something startling. Participants who were only in their 50s had a hard time repeatedly rising up and sitting down from their chairs for 30 seconds at a time. It also appeared to be the age when people began having difficulty standing on one leg for one minute. As expected, difficulties were more pronounced among participants in their 60s and 70s. These older subjects also showed problems with endurance and walking speed. These results suggest that our muscles weaken steadily starting at age 50. But thankfully, new research has shown that there may be a very simple way to preserve muscle strength as you age. What you eat may have a direct effect on muscle mass. In particular, the amino acids found in protein are necessary fuel for the maintenance and growth of muscle tissue. Unfortunately, many individuals get most of their protein from afternoon or evening meals. This is especially true of seniors. With this in mind, researchers at McGill University Health Center reviewed protein consumption patterns of over 1,700 healthy men and women between 67 and 84 years of age. Then, they linked these patterns to variables such as strength and muscle mass. What did they learn? People who balanced protein intake throughout the day had more muscle strength than those who ate more during the evening meal and less at breakfast. 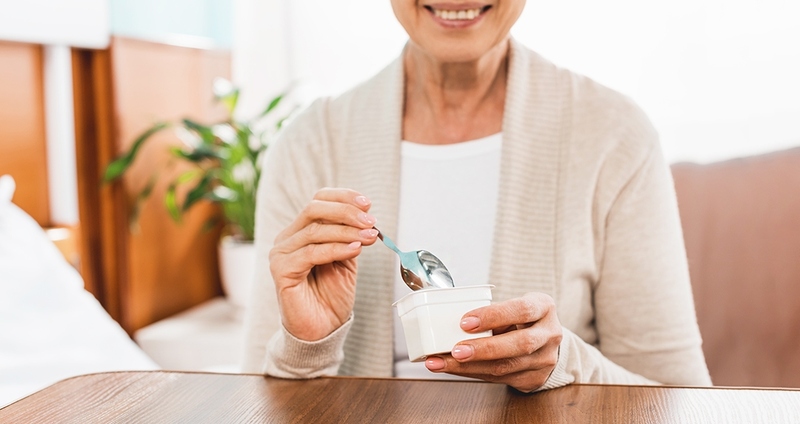 “Our research is based on scientific evidence demonstrating that older people need to consume more protein per meal because they need a greater boost of amino acids for protein synthesis,” said Dr. Stéphanie Chevalier, lead author of the study. Spreading protein intake throughout the day isn’t difficult to do. At breakfast, you have several healthy options: eggs, Greek yogurt, fruit topped with protein-packed nuts, or even a protein shake. If you’re a salad eater, try sprinkling beans, seeds and nuts over the top. Chop up some boiled egg, chicken or turkey to boost the protein profile even further. If you prefer animal-sourced meats as the center of your meals, seafood, poultry and lean red meats all have high protein content.